With its breathtaking setting and it’s eclectic choices in artists, the American Songbook at The Allen Room at Jazz at Lincoln Center is one of New York’s best annual concert series. This year, the American Songbook series is digging deep into the indie canon once again with shows by the likes of: Nellie Mackay, Dirty Projectors, St. Vincent, Gabriel Kahane and a Hal Willner curated evening featuring Rufus Wainwright (ahem, he’s Canadian), Bill Frisell, and Van Dyke Parks. Sure, you can see some of these acts at other venues in city, but once you’ve experienced a show at the Allen Room, you’ll realize why you wouldn’t want to go anywhere else. To enter the contest, fill out the entry form after the jump. A random winner will be notified and selected on November 12, 2009 at noon. Contest is only available to US residents. 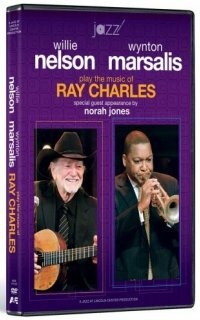 View more details on the Willie Nelson/Wynton Marsalis Ray Charles DVD and the full American Songbook schedule after the jump. Once in a while the stars align and something magical happens…as on the night Jazz at Lincoln Center presented a salute to the late, great bluesman, Ray Charles. Two musical iconoclasts, Willie Nelson and Wynton Marsalis, along with the stunning songstress Norah Jones, collectively brought their unique musical perspective to the legendary artist s hits such as Hallelujah I Love Her So, Hit the Road Jack, and Unchain My Heart. The evening s musicians are supported by insightful and vibrant performances from saxaphonist Walter Blanding, pianist Dan Nimmer, bassist Carlos Henriquez, drummer Ali Jackson, and harmonica great Mickey Raphael. WILLIE NELSON AND WYNTON MARSALIS PLAY THE MUSIC OF RAY CHARLES gives music lovers a front-row seat to the sold-out concert in New York City at Rose Theater, including rehearsal footage, exclusive interviews and photos. Thanks, Bumpershine! Love Willie Nelson’s! Who doesn’t love the American Songbook? Jazz!